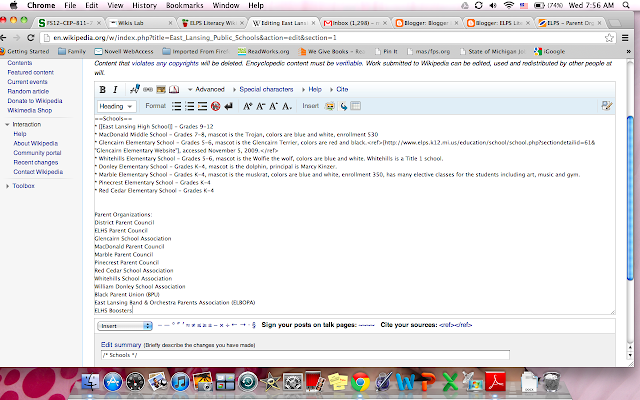 Did you know East Lansing Public Schools is on Wikipedia? Take a look! You can add information about ELPS! I noticed our many Parent Organizations were not mentioned, so I added that. If you want to add something, just edit the page and save! If you haven't seen it, visit it here. This Wiki is meant to be a companion to this Literacy Newsletter Blog and is a place we can store materials, share materials, and collaborate on our current projects. Here you will find materials for our current projects, such as the RAISE work being done with a group of ELHS teachers, but also past professional development materials, both K-6 and 7-12, CCSS materials, commonly referenced research on reading and writing instruction, and materials you can distribute to parents and/or students. Please navigate to the various pages by clicking on the links to the right. If you are looking for something, and cannot find it, please do not hesitate to contact me! To meet the needs of all learners, and make learning possible, I have modified my lesson in the Universal Design for Learning model (UDL). The changes reflect considerations for recognition, strategic, and affective areas. 1 A problem or a need – With Common Core State Standards requiring literacy in all content areas, teachers will need to solidify their understanding of disciplinary literacy and reading for understanding. 2 A real-world performance – how the learning objective fits into a real-world activity or need. Teachers will be aware of, understand, include in their lesson plan, and implement one or more of the Common Core State Standards for Literacy in History/Social Studies, Science and Technical Subjects. 3 An instructional objective – the objectives are based on the final outcome, activity or test. These objectives will each be different for the four types of knowledge; performing skills, recalling facts, identifying examples of concepts, and applying principles. Teachers will read and understand the Common Core State Standards for literacy in History/Social Studies, Science and Technical Subjects. Teachers will solidify their understanding of the “Big Five” of adolescent literacy. Teachers will create a lesson plan to incorporate one a reading, writing, speaking, or listening strategy into their content area literacy. Teachers will need to read/review the elements of adolescent literacy in the content area through research articles available online, and other online resources. · UDL: Summarize and provide main points in another format. UDL: Provide paper copies to those who need it. After reading the articles, webcasts, and reviewing the professional development presentations, teachers will create their own lesson plan incorporating one of the elements into a lesson in their content area. 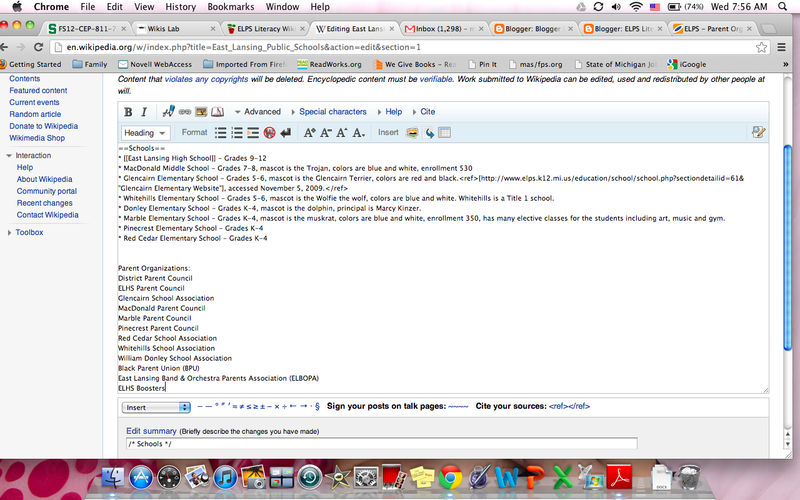 Teachers will submit their final lesson plan to our Companion Wikispace. The lesson plan must be in the Backwards Design model (Wiggins and McTighe) format and focus on incorporating one of the five elements of adolescent literacy into their content areas, and meeting at least one CCSS. Teachers will deliver the lesson to their students and video tape the teaching. A follow-up lesson will be to watch and reflect upon the lesson with their TLT partner (Teachers Learning Together). 6 A method to help participants learn – the method to deliver the content; a lesson. *UDL: for continued support, Provide chat sessions (Adobe Connect, Google Hangout). -Provide one-on-one time on the telephone. Utilize Google Docs to provide feedback on student work and/or work on it with them. ○ Meaningfullness – content and activities must have meaning for the learner. This lesson and activity begins to meet the CCSS expectations for teachers to incorporate literacy in the content areas. Administrators look for this upon teacher evaluation. Knowledge of meeting teaching objectives, CCSS, and the needs of their students as learners. Several online resources are available: Blogs, videos, and example plans, in addition to face-to-face time with myself (literacy consultant/instructional coach) and a peer/fellow teachers. Teachers work with their TLT partner, formerly arranged through work Kevin Feldman training around student engagement and motivation. These partners frequently work together on plannig and observing each others teaching. Trust has been built between these teaching partners. ○ Skill level (including technology skills). All adults are college educated, although technology skill level may vary. ○ Prerequisite knowledge (including technology background): Teachers will need to know basic lesson plan design, and how to access our past professional development on our Blog and Wikispace. UDL: Provide some background knowledge of the lesson plan structure and technology (via article or video) or one-on-one support. ● Technology Needs – the computers, software, programs (such as Angel or other CMS’s) printers, equipment, Internet access, time in the computer lab will be needed to successfully complete your technology-rich lesson. Teachers may use the PC with internet access available in their classrooms. The International Reading Association has issued a concise, detailed statement regarding guidelines for implementing the Common Core State Standards. If you haven't had a chance to read this short document, it is well worth your time for the clarification and understanding it provides. You can download it at the IRA site. Ever consider creating podcasts with your students? What is a podcast? ReadWriteThink has a guide for grades 3-12 teachers on creating podcasts with students. Podcasts can be used across grade levels and content areas. This tool provides the nuts and bolts of creating a podcast, including links to video tutorials with thorough instructions and free software. Peruse the "Extras" section to access resources with free audio and images to use with your podcasts. I enjoy working with digital literacy and technology in the classroom. If you consider doing podcasts with your students and need help, please contact me! need to solidify their understanding of disciplinary literacy and reading for understanding. Teachers will be aware of, understand, include in their lesson plan, and implement one or more learning objectives of the Common Core State Standards for Literacy in History/Social Studies, Science and Technical Subjects. -Teachers will read and understand the Common Core State Standards for literacy in History/Social Studies, Science and Technical Subjects. -Teachers will solidify their understanding of the “Big Five” of adolescent literacy. -Teachers will create a lesson plan to incorporate one a reading, writing, speaking, or listening strategy into their content area literacy. Teachers may need to read/review the elements of adolescent literacy in the content area through research articles available online, and other online resources. -Teachers may submit their final lesson plan to our Companion Wikispace. The lesson plan must be in the Backwards Design model (Wiggins and McTighe) format and focus on incorporating one of the five elements of adolescent literacy into their content areas, and meeting at least one CCSS. -Teachers may deliver the lesson to their students and video tape the teaching. A follow-up lesson will be to watch and reflect upon the lesson with their TLT partner (Teachers Learning Together). Prerequisite knowledge (including technology background): Teachers will need to know basic lesson plan design, and how to access our past professional development on our Blog and Wikispace.